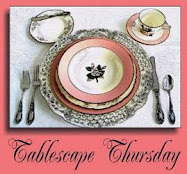 It's time for another Tablescape Thursday with our hostess, Susan at Between Naps on the Porch! Thank you to those of you who have left such generous and thoughtful comments for me during the past few weeks. I haven't had time to visit nearly as many of you as I'd like to lately. I hope you'll be patient and know I'll stop by when I can. First of all, I'd like to congratulate Maria of Chica Bella Crafts. She's the winner of the April Cornell napkin giveaway. I copied and pasted links to the Google profiles of everyone who left comments on my "Day into Evening" table with April Cornell post. If you missed it, you can see it HERE. I pasted the links twice for followers, and three times for e-mail subscribers. Then I numbered the list in a Word document and used an online random number generator to find the number that matched one of the links that led me to Maria's blog. I was pleasantly surprised that Maria had done a post on table linens that featured April Cornell's designs (and kindly mentioned having discovered April Cornell through my post!). I'm so pleased that Maria won. If you haven't visited her blog, I hope you'll stop by and say hi. Congratulations to Maria for winning the April Cornell napkin giveaway. I haven't seen your breakfast bar before today. I really thought, the porcelain is Wedgewoods Florentine. So it was very interesting to learn something about Myott/Staffordshire. I like to get all this informations about your stunning inventory with the Tablescapes. This is a very nice breakfast. What would I like to have? Maybe, French toast, topped with cherry jam and whipped cream. And a cup of Earl Grey tea, please. Thank you for sharing this nice candle light breakfast bar. The Rock Sharpe crystal is just stunning -- what a deal you got! I love colorful china patterns, and this one is new to me. Thanks for all the interesting historical tidbits you include in your posts -- I'm learning a lot! 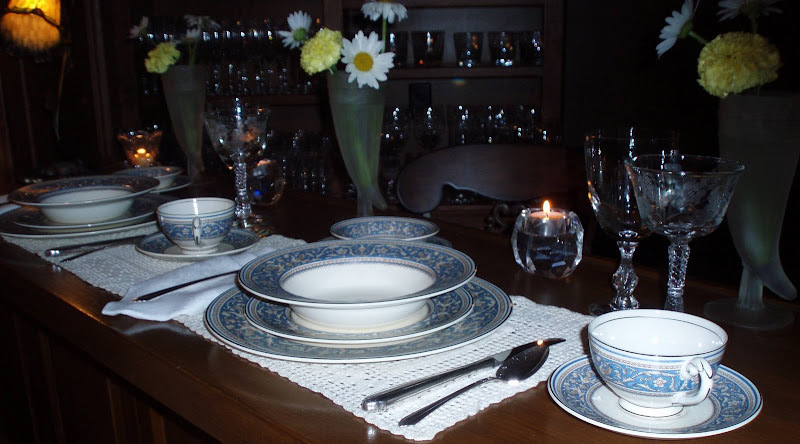 Your things are always so nice and your settings are always so classic and you have such nice china! Beautiful, Bill. I really love the unique vase! Bill, I am so glad you repeated this gorgeous setting for us new bloggers. I always look forward to your post, and was thrilled to find you had it up nice and early today. 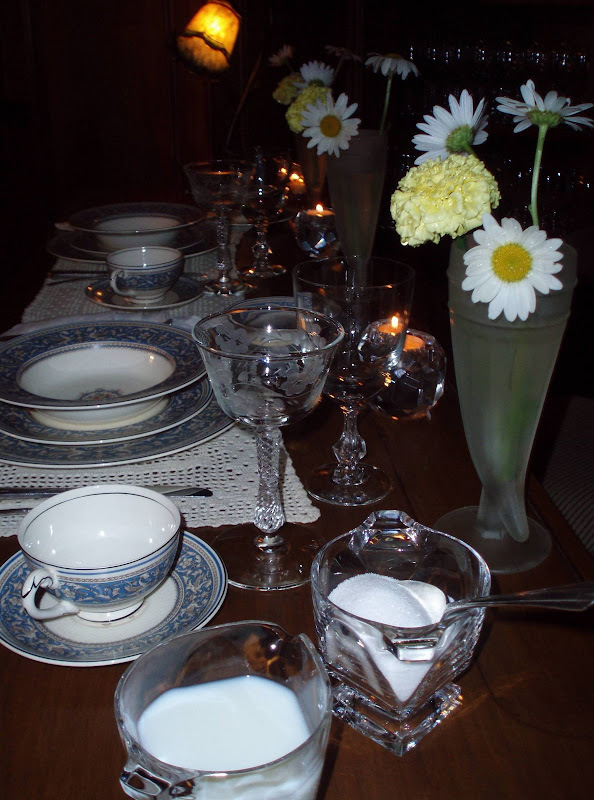 Thanks for sharing yet another gorgeous tablescape. Now I have to look for Rock Sharpe crystal! Another gorgeous setting. I will be back next week. 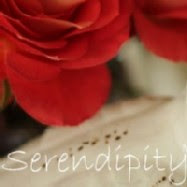 I have been redesigning blog and got bogged down. Beautiful as always, Bill! I really like that shade of blue, very pretty. I am not a beer drinker -- but for some reason I'm always attracted to the pilsners you post -- and you always find wonderful ways to use them. Your barscape is so elegant for breakfast -- I'll have an omlet, fruit and some coffee please. So pretty! Any meal would be good at that setting. Back a few weeks ago, there was an Estate Sale listed in this area that had tons of china/crystal/silverware, etc. I immediately thought - Wonder if Bill knows about this sale! :-D I was tempted, but still trying to clean out - not add. Have a great weekend. Beautiful Bill..I love the china! Will you take me shopping? Pleassseee? You find such incredible deals! I love the china! That color of blue is so pretty. Thanks for sharing! Bill, You always seem to find the prettiest pieces and at a tremendous bargain. Love the china! Very pretty! I've just started going to more Estate Sales and I have to get better at the "haggling" aspect. I'm always afraid that it would be insulting to offer less. 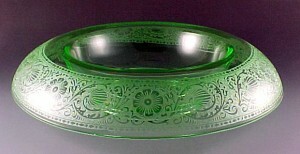 Thanks for sharing your beautiful finds and my, my at the glassware! You've done it again. 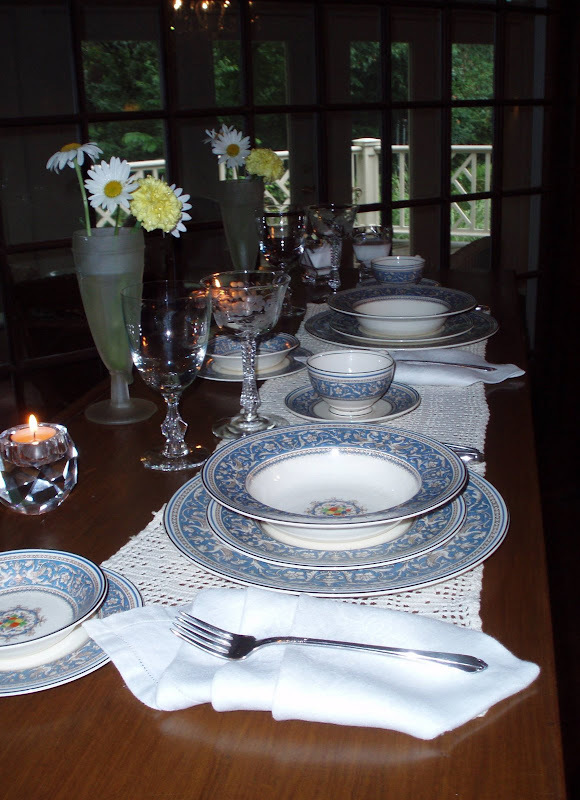 Set another fantastic tablescape that is :-)) I'm sure whatever you are serving will be perfect. I'm so glad that you shared this again. I missed it the first time. Everything is fabulous! I always love to see what you collect. You always give us so much info on each piece. I really appreciate that. I'm glad to see this post since I fall in the "newer" group of readers. I always love everything you do, you never disappoint with your selections, knowledge of each piece, which I really like by the way and of course your flowers. Thank you again for a beautiful post! What a nice way to start off my day at this lovely breakfast bar setting! I am in awe over your wonderful collections & the knowledge you impart with each posting. 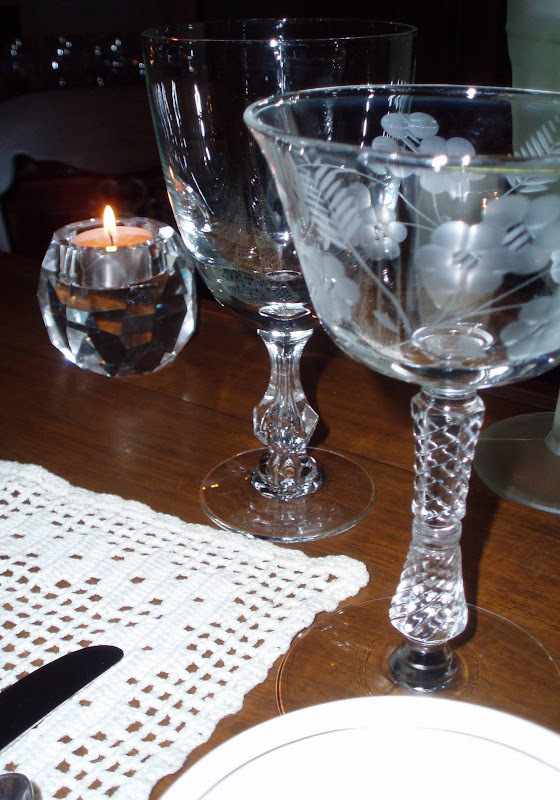 I can't tell the difference between Princess etched glassware & the Rock Sharpe crystal. I'm curious as to where you find all your information. It almost makes me sad to think that some woman's hand crocheted work went for $1 but then I'm thrilled that YOU rescued it from perhaps a worse fate & now share it with so many others to enjoy. You have a very discerning & discriminating eye for finding the most extraordinary pieces. No new table for me this week...my guests had to reschedule for this coming weekend, so the table is still set from last week, sans flowers. Oh & may I have a toasted English muffin with a thin slice of Asiago cheese, topped with tomato, please? I'd also like a cup of Lady Grey tea if you have it, but Lipton will do just fine, too, if not. ;-) Thank you for inviting us to breakfast! These are beautiful dishes Bill. You really lucked out on those estate sales, speaking of luck, I feel extremely lucky to have won!! !I'm very excited and can't wait to receive them in the mail. I have been inspired to pay it forward and on today's post, I'm doing just that. I hope you have a wonderful weekend and thanks so much for having the give-away. 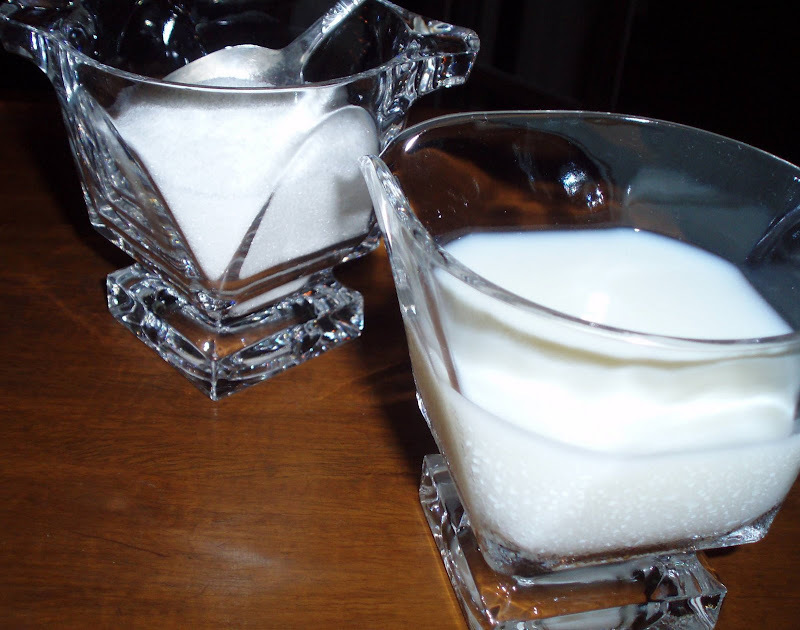 I love all the history about your tablesetting items. The cocheted runner used as placemats is such a good idea. You always amaze and inspire me with your posts. Thanks for sharing your wealth of knowledge. Big congrats to Maria on her giveaway win. Very pretty! I don't remember seeing this before. I thought you and I started about the same time last year. I also did a re-post tonight - my Cameo Appearance tablescape. Beautiful china Bill. How do you come up with all that fantastic Fostoria? You have a really good eye. Answering my own questions today. I am following, tried to do that a few weeks ago and have been having trouble with internet. Can't comment or do half the things I need to. Have a great weekend! Look forward to all your posts. Glad to see this one now since I am new and haven't seen it before. Everything is beautiful and it is fun to learn the pattern names and history. Interesting patterns! 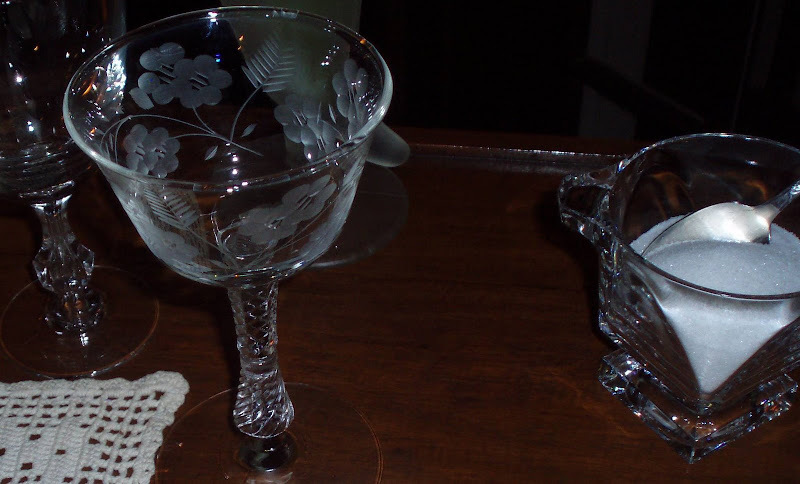 One of the stemware sets reminds me of a pattern on some depression-era wineglasses that I was gifted with. I love your idea of the "Breakfast Bar"! 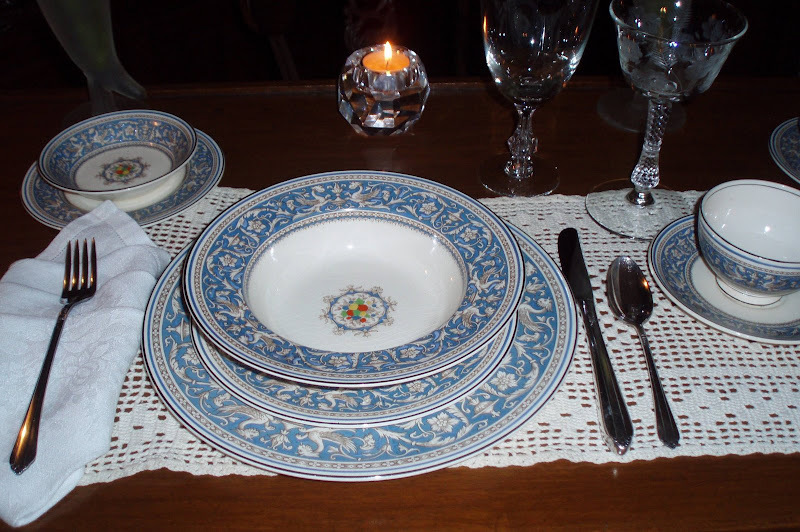 Bill, love the patterns of both the china and the stemware in this post. You have magnificent taste and talent and I always love to visit. I need to get back to posting again- life is finally getting back to normal and I need to get out estate sale shopping and thrifting. Take care. This is one of my very fav patterns that you have...I love it! The crystal is stunning! You have such amazing taste in crystal...I always love it! Great price you negotiated, too! So enchanting and dream like.Beautiful. I've changed my blog address and since you were following me, I thought I'd give you my new address, click on profile. I hope all is well, looking forward to your next post. By the way, thanks so much for the napkins, they are very pretty and the napkin rings were a very nice surprise. Bill, dear, I'm checking in with you after I've been MIA for a bit because it suddenly dawned on me that YOU are in Tennessee! I'm not sure if you were affected by the flooding (I just read about this... I've been sort of MIA from life), and I was concerned. I hope and pray that all is well. OMG! Your crochett runner looks exactly like one my grandmother made for me, but I mean...exactly! Love those blue dishes, gosh, they're stunning! OMG! Your runner looks like the one my grandma made for me, the crochett's exactly alike, I mean exactly! Love those blue dishes, stunning.